All books are available and the prices are current. 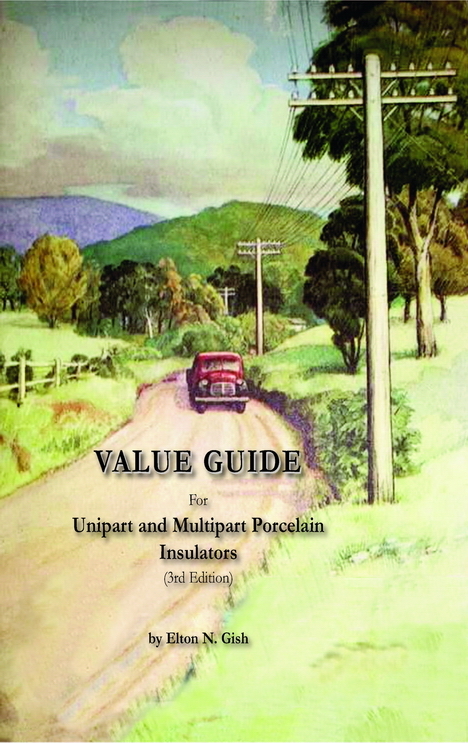 This 2015 book is the newest Guide Book for unipart (one-part) pin-type porcelain insulators. 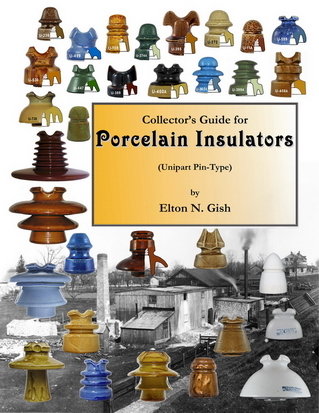 It is like no other book about porcelain insulators. This is the culmination of more than 45 years of research and nearly 5 years of work to write and photograph all known unipart styles. The 1012 pin-type styles are shown in COLOR using reference photographs of actual insulators. The Unipart Chart has been reduced by 20% by removing most of the trimmer variants and styles assigned from catalogs that did not match actual insulators. It has a very detailed history of each manufacturer with nearly 500 historic and other photographs many of which are in color. Every aspect of unipart pin-type porcelain insulators is discussed as well as examples of 286 types of markings that have been reported. Mike Spadafora wrote an Appendix section summarizing his decades of hunting and researching Fred Locke insulators and digging in the Victor plant dump. He tells how you can determine the approximate year of manufacture by glaze and manufacturing characteristics. The book is 278 page book is spiral bound so it will lay flat when opened. The size is 8-1/2 x 11. The book is available NOW. Price is $49 plus $5 U.S. shipping. (Canadian orders will include $24 shipping -- $73 total.) If paying with credit card or Paypal, shipping will be added automatically. Canadian orders for the Guide Book and Value Book combined, please add $49.70 for shipping ($127.70 total). You may send a personal check, money order, or use PayPal. The 126-page Value Guide lists manufacturer, marking, catalog number, color, rarity and value for 4354 different unipart pin-type styles and 1201 different multipart pin-type styles. In addition there are color photos showing 10 new U-numbers; 82 new M-numbers; 4 pages of color photos showing various glaze colors and typical descriptions; and 2 pages of color photos showing some rather odd and interesting examples of glazes. The 8.5 x 11 spiral bound 3rd edition Value Guide has a heavy weight cover for better durability. Price is $29 plus $4 shipping ($33 total). Add $16 for Canada ($45 total). 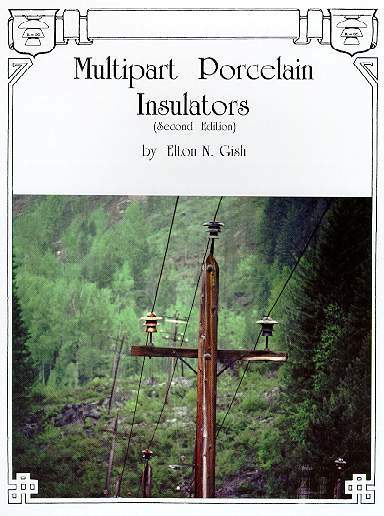 This 379-page book provides drawings and photographs of 568 different styles of multipart porcelain insulators identified with M-numbers. In addition, it contains a wealth of information on old power lines, historic photographs of insulators in service, the history of electrical power, company histories, markings found on multipart insulators, patents, value guide, and much, much more. The soft cover book ($25 ppd, plastic spiral bound so it will open flat) has a beautiful color photograph on the cover showing old insulators in a beautiful mountain scene. The limited edition hardbound book ($35 ppd) will be available while supply lasts. The author is Elton Gish. To order, send payment to Elton Gish, 5415 Lexington Circle, Lumberton, TX 77657. (Please add $15 for postage to Canada) You may send a personal check, money order, or use PayPal to send payment. This 343-page book gives a detailed history of Fred Locke, the father of porcelain insulators. There are many historical photographs as well as photographs and scale drawings that show all of the porcelain and glass insulators he produced. You will be fascinated by his involvement with Pyrex glass, Corning Glass Works, Fry glass insulators, and many of his other glass patents. The author is Elton Gish ($25 ppd). Canadian orders will include $24 for shipping. You may send a personal check, money order, or use PayPal. $25 ppd. H. Morgan Brookfield reprinted the original catalog his uncle, William Brookfield, owns. It is an embossed hard cover book that is stitched together and has approximately 167 pages printed on slick magazine quality paper. He added a 24 page dedication to the Brookfield Glass Company Founding Fathers and 3 different cross references in the back. The dedication section includes several Brookfield patents, family photos, factory photos, company stock certificate and seal, and family history. 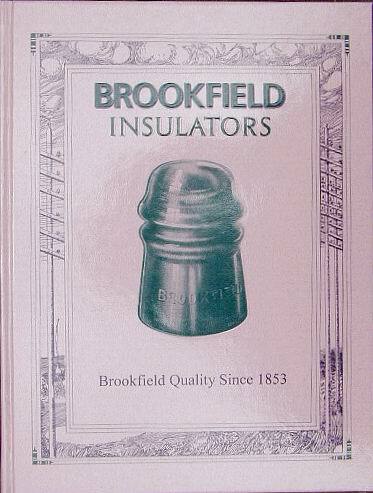 This is the only book available with detailed mechanical drawings of almost every Brookfield Insulator. If you are a serious glass insulator collector or just a casual Brookfield insulator collector, you will want one of these books for your reference library! It is beautifully published to last several lifetimes. $38 ppd. Canadian order please add $14 for postage.